This month, we have been experiencing lots of arctic air and sub-freezing temperatures. And as always with these temperatures, we are talking to many customers about frozen water pipes and how best to prevent them in the future. Many of us have been told to leave our faucets running when frigid temperatures are expected… but how fast of a drip is appropriate? Or, when is a slow drip too slow and freezing could still occur? If you have experienced frozen pipes before, you have probably contemplated running a heater or insulating problem areas better, but what if I told you there was a more permanent, yet simple solution to prevent frozen pipes? 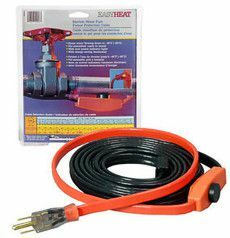 EasyHeat water pipe freeze protection cables are a great alternative to keeping your pipes flowing free without wasting water with a constant drip from the faucet. EasyHeat cables are not to be used in thawing out an already frozen pipe, instead they are designed to keep pipes from freezing the next time. The concept is quite simple and any homeowner can install them! The cable comes in varying lengths and is to be positioned flat against the pipe and held tight with electrical tape. Once in place, you will wrap the cable and pipe with foam pipe insulation, and plug the EasyHeat into the wall. That is it! Even better yet, the cable has a built-in thermostat and comes on automatically when temperatures reach the critical zone. The cables do not get steaming hot, so you do not need to worry about them getting too hot for the insulation used to cover them up. Use them as needed when freezing weather is expected or leave them plugged in all the time. Cables are sold in various lengths. Stop in and see our plumbing department for more details!